Delightful Village in the Swiss Alps with Spectacular Views!! Murren has a unique setting on a mountain ledge with breathtaking scenery in all directions. It is a "must see" on your Switzerland Holiday in the Bernese Oberland. I have stayed both here and in Lauterbrunnen. Lauterbrunnen is a great base for day trips in the Bernese Oberland. You can hop right on the Swiss Rail Train to Interlaken where you can transfer to many places in Switzerland. 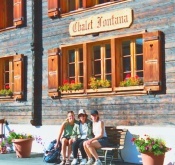 Murren is a perfect base for a Swiss Hiking Vacation or a restful getaway . go to the end of Lauterbrunnen Valley and take the gondola up to town. My mom, sister, niece and I stayed here on our girls getaway European Vacation. We went in September....what a beautiful time of year to travel here. The colors of the mountains were lovely....and lodging prices discounted. ....we woke up to SNOW!! Eiger Hotel - the only hotel with indoor swimming pool, jacuzzi, sauna and solarium. 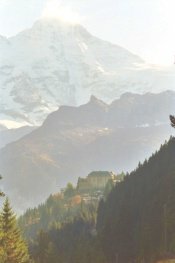 If you are looking for inexpensive chalets and hotels, here are a couple of choices for Swiss budget accommodations. Eiger Guesthouse - We are THE budget place in car free Muerren with the most fantastic views of the Eiger, Moench and Jungfrau. 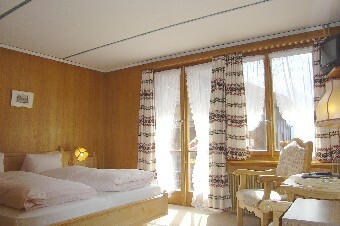 Blumental Hotel - The Blumental is a rustic Swiss hotel with a lot of charm and a cosy atmosphere. This is a great option for family European vacation getaways or for two couples traveling together. Short hike down to Gimmelwald, a sleepy little "hamlet". Gimmelwald is famous because it is a favorite of Rick Steves. Hike part of Grutchalp trail to Winteregg Station, then....return by train. 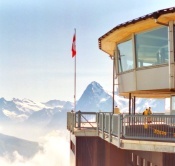 One of the highlights of our Swiss vacation getaway was taking the cable car up to the amazing revolving restaurant on the Schilthorn. It is a good idea to go early in the day when it is clear, as the clouds often come in and you might not have the views.....which are unbelievable. Have breakfast, enjoying the breathtaking views! This was the setting for the James Bond movie On Her Majesty's Secret Service. The cable car trip (you can hike part of the way if you like!) is quite a ride. The views of the Alps are simply awesome! You can't help but fall in love with Murren Switzerland!